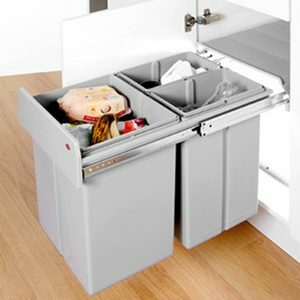 The Wesco Double Waste Bin – 32L is the mid-sized bin in Wesco’s best-selling Big fitted kitchen bin range. 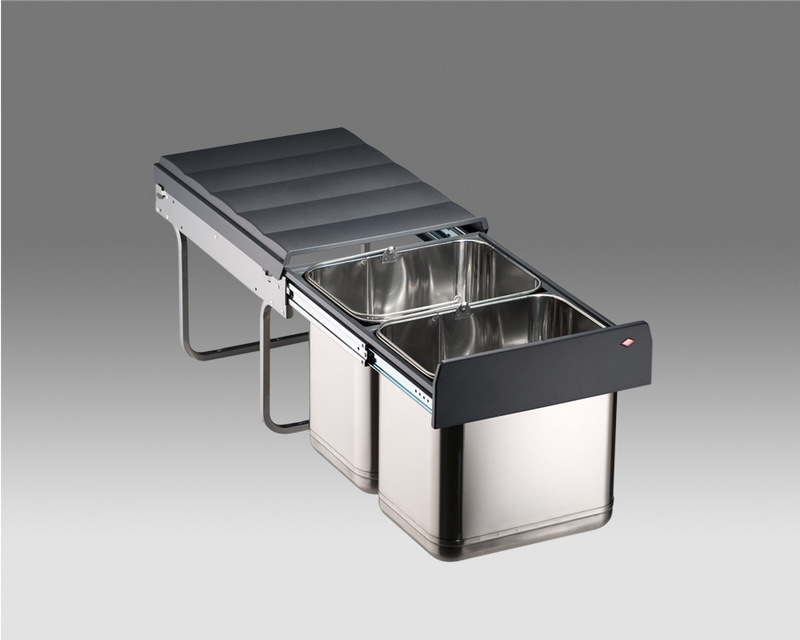 Made for hinged door cabinets, it has 2 x 16L internal Stainless Steel bins hanging from a floor mounted frame. Fix the frame to the base of your cupboard and the bins will pull out on full extension ball bearing runners. 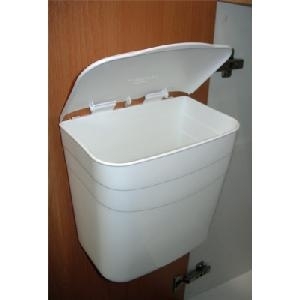 Wesco is the one of the best in kitchen rubbish, pullout bins. 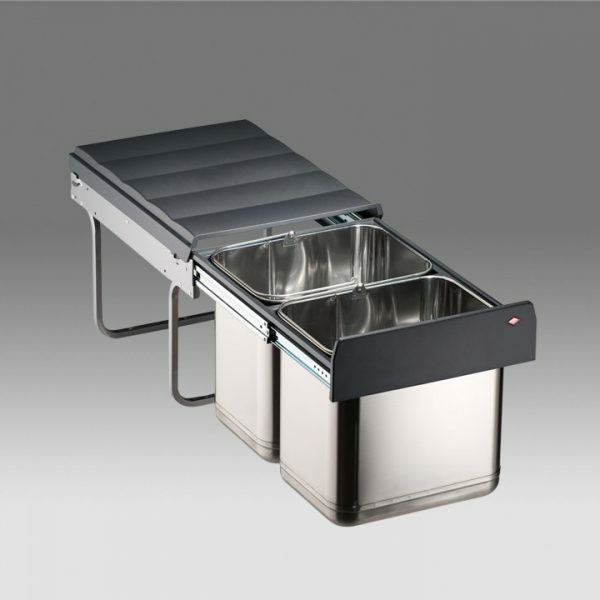 The Wesco Double Waste Bin – 32L is the mid-sized bin in Wesco’s best-selling Big fitted kitchen bin range. Made for hinged door cabinets, it has 2 x 16L internal bins hanging from a floor mounted frame. Fix the frame to the base of your cupboard and the bins will pull out on full extension ball bearing runners. When measuring up, check that you allow for clearance of any internal door hinges, including when you pull out the internal bins. 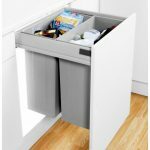 “In frame” kitchen units are kitchen units which have a frame around their doors/drawer fronts which reduce the size of the aperture through which a bin will pull open. Measure your aperture dimensions – your bin cannot be bigger than the aperture. – Metal frame which screws into bottom of cupboard. – Full extension ball bearing slides. 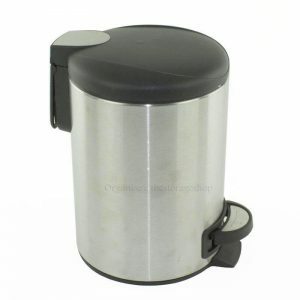 – Stainless steel buckets with steel rod handles. 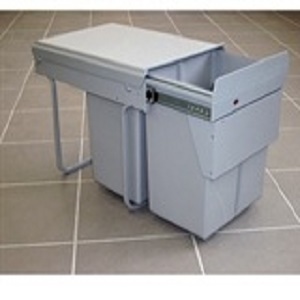 – Buckets are easily removed for emptying and cleaning. – Made in Germany by Wesco.